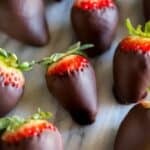 A step by step guide for how to make EASY Chocolate Covered Strawberries, including ideas for toppings and a guide for making a DIY strawberry bouquet. Start by washing the strawberries and then drying them VERY well. It's so important to dry the strawberries well because, as you may know, chocolate and water do not work well together! If the strawberries are the least bit wet the chocolate will not stick! Next pour the milk chocolate chips and white chocolate chips into their own microwaveable bowls. Pour the nuts and coconut onto their own small plates. Line a sheet pan with parchment or waxed paper. Microwave the milk chocolate for 30 seconds intervals, removing and stirring at each 30 second interval, until the chocolate has melted. Repeat with the white chocolate chips until they are melted. Stir often, making sure not to burn the chocolate! Holding a strawberry by the stem, dip into the milk chocolate, lift and twist slightly, letting the excess chocolate fall back into the bowl. At this point you may dip the strawberry in coconut or nuts (or leave it plain) and then place the strawberry on the parchment paper. Repeat with the rest of the strawberries. For a white chocolate drizzled strawberry, dip a fork in the melted white chocolate and drizzle the white chocolate over the dipped strawberries. Chill the strawberries until the chocolate sets, about 15 minutes. *I prefer to use bittersweet or semi-sweet chocolate, but milk chocolate will also work great! Also, feel free to add toppings to your chocolate strawberries, like crushed nuts or coconut flakes. Dip them in the topping immediately after you've dipped them in the melted chocolate.